The 3rd and Final Stretch Music Festival | April 9th-12th, 2019 - TheUrbanMusicScene.com | Concerts & Festivals! New York, NY- Harlem Stage, the legendary uptown venue that for over 35 years has promoted the creative legacy of Harlem and artists of color from around the corner and across the globe, is proud to present its Spring 2019 season of performances. The 2019 spring season is curated by Monique Martin, Director of Programming for Harlem Stage and features artists who #Disrupt and take creative risk. The performances feature a range of artistic genres, offering audiences the chance to experience legendary performers, as well as rising stars. Harlem Stage is thrilled to continue its partnership with Edison Award-winning and Grammy-nominated trumpeter Christian Scott aTunde Adjuah to re-establish jazz as a social music through the Stretch Music Residency. This third and final year of Adjuah’s residency will feature the 3rd and final installment of the Stretch Music Festival. Featuring artists including Saul Williams, the Logan Richardson band, Freelance and more. The festival also includes a FREE Stretch Music Intensive, in addition to a performance from the Steve Turre Quintet as part of the Jazz Then and Now conversation series. The series kicks off on April 9th as Christian Scott aTunde Adjuah returns to Manhattan School of Music to lead a FREE masterclass on his genre blind Stretch Music. All music students, musicians and lovers of the jazz idiom and all its variabilities are welcomed to join this immersive workshop centered on improvisation, technique and thriving as a working artist today. Also on April 9th, is a free pop-up performance at Silvana’s Restaurant featuring drummer, producer and composer King Klavé. On April 11th, as part of the Jazz Then and Now series, Christian Scott aTunde Adjuah will be in conversation with composer and trombonist Steve Turre on improvisation, technology, collaboration, the importance of the historical lineage and more. The conversation will be preceded with a live performance by the Steve Turre Quintet. Jazz Then and Now is a conversation series, presented as part of the Stretch Music Residency that brings together innovative thought leaders in the field in dialogue on the history, the present and the future of jazz. 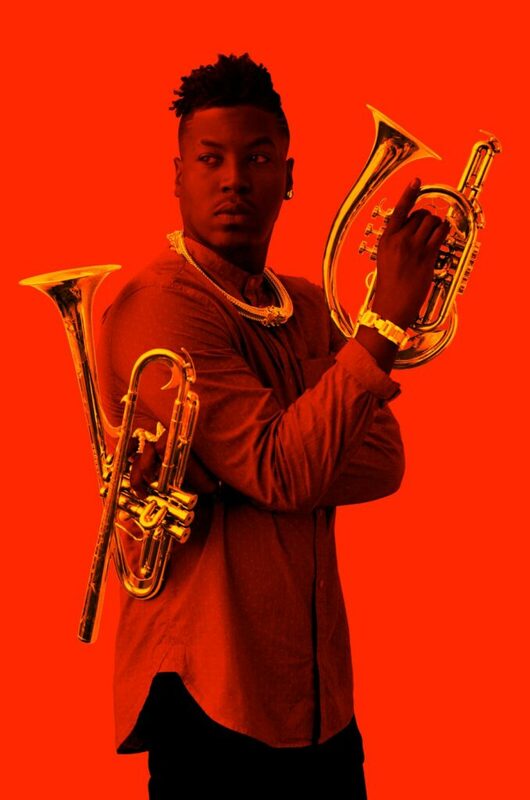 Closing out the series on April 12th, Christian Scott aTunde Adjuah curates and performs at his final Stretch Music Festival under his three-year residency with Harlem Stage. The generosity, leadership and innovation Christian has brought to the Harlem Stage Gatehouse and broader New York community is extraordinary. The audience can anticipate another powerful festival that will once again advance and stretch the landscape of jazz. The evening will feature stellar guests including Saul Williams, the Logan Richardson band, Freelance and more, as Christian connects West African rhythms with his Afro New Orleanian cultural traditions to the sonic freedoms of creative improvised music. Come ready to be Stretched! Jazz Then and Now is a conversation series, presented as part of the Stretch Music Residency that brings together innovative thought leaders in the field in dialogue on the history, the present and the future of jazz. Christian Scott aTunde Adjuahwill be in conversation with composer and trombonist Steve Turreon improvisation, technology, collaboration, the importance of the historical lineage and more. The conversation will be preceded by a live performance with the Steve Turre Quintet. Edison Award winning and Grammy nominated Christian Scott aTunde Adjuah curates and performs his final Stretch Music Festival under his three-year residency with Harlem Stage. The generosity, leadership and innovation Christian has brought to the Harlem Stage Gatehouse and broader New York community is extraordinary. We are excited to once again create space for Christian’s musical explorations, community of ferocious artists and conceptualists. We anticipate another powerful festival that will once again advance and stretch the landscape of jazz. You can expect stellar guests including Saul Williams, the Logan Richardson band, Freelance and more, as Christian connects West African rhythms with his Afro New Orleanian cultural traditions to the sonic freedoms of creative improvised music. Come ready to be Stretched! “This season we are conversing, collaborating, and of course singing and dancing. We are thrilled to be working with a growing list of programming partners, who enable us to bring new audiences to Harlem Stage and align ourselves with organizations and artists who share our values. We welcome you to join in this communion of art that informs, inspires and ultimately transforms,” said Patricia Cruz, Executive Director of Harlem Stage. Box Office Location: Harlem Stage Gatehouse (150 Convent Avenue at West 135th Street, Manhattan). Box Office Hours: Regular box office hours are 10AM–3PM Monday through Friday, except on performance days when the box office remains open until one hour after the start of the performance. Harlem Stage is the performing arts center that bridges Harlem’s cultural legacy to contemporary artists of color and dares to provide the artistic freedom that gives birth to new ideas. For over 35 years Harlem Stage has been one of the nation’s leading arts organizations, achieving this distinction through its work with artists of color and by facilitating a productive engagement with the communities it serves through the performing arts. With a long-standing tradition of supporting artists and organizations around the corner and across the globe, Harlem Stage boasts such legendary artists as Harry Belafonte, Max Roach, Sekou Sundiata, Abbey Lincoln, Sonia Sanchez, Eddie Palmieri, Maya Angelou and Tito Puente, as well as contemporary artists like Bill T. Jones, Christian Scott aTunde Adjuah, Tamar-kali, Vijay Iyer, Mike Ladd, Stew, Meshell Ndegeocello, Jason Moran, José James, Nona Hendryx and more. Its education program each year provides over 1,000 New York City children with introduction and access to the rich diversity, excitement and inspiration of the performing arts. In 2006, Harlem Stage opened the landmarked, award-winning Harlem Stage Gatehouse. This once abandoned space, originally a pivotal source for distributing fresh water to New York City, is now a vital source of creativity, ideas and culture. Harlem Stage is a winner of the William Dawson Award for Programming Excellence and Sustained Achievement in Programming (Association of Performing Arts Presenters). For more information on Harlem Stage, visit: www.harlemstage.org.